Home » Music » DNFMOMD » DNFMOMD: Thursday at PA’s Lounge – tour kick-off show, new songs, great bands! DNFMOMD: Thursday at PA’s Lounge – tour kick-off show, new songs, great bands! Thursday, July 15th we’re very excited to play our very first show in our hometown of Somerville at PA’s Lounge! We’ll be debuting two new songs we’ve been working on, Episode 5: Free For All, and Episode 8: The General! This is also something of a “tour kick-off” for us as we’re headed out on the road on July 22nd! There will be a more thorough post about that ASAP but for now check out our tour dates (including stops in NYC, DC, VA, OH, PA, NY) here! 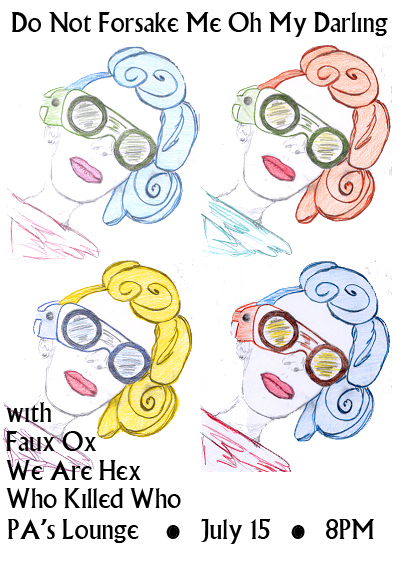 Also on the bill are:Faux Ox– a newer Boston band we’re psyched to share the stage with- the recordings are hyperactive, post-apocalyptic, post-punk weirdness in the best possible way – I hear goth-Devo. We Are Hex is an Indianapolis band that we’re excited to bring to town for their Boston debut. They are currently on the NME best free mp3 downloads of the week with a lot of other great acts. They were just signed to Roaring Colonel (affiliated with My Old Kentucky Blog) and their debut comes out in a few weeks. Be one of the cool kids who saw them before they got big! They are female-fronted garage rock – think PJ Harvey fronting Jesus and Mary Chain. Who Killed Who open up the night, they play raw, bombastic hard-indie rock.